wooldancer: Organic merino handdyeds in my new web store! Organic merino handdyeds in my new web store! Yes - We are now open for business at www.wooldancer.com hurrah! I hope you can feel the behind the scenes bliss here.. there is much ravelment & party goings on.. and we are passing Celebration Sales on to you my friends..
so please check out the shop & be sure to have yourself some Celebration sales fun! We are listing new products daily, be quick.. many are one-of-a-kind.. sale on until Oct 10 2008. This is a quick post.. much more news to follow..
Congratulations babe :-) I'm so thrilled and excited for you! We need to schedule a chat on the phone SOON! Beginner Spinning + Batt Lab (carding & fibre prep) Enrol now! 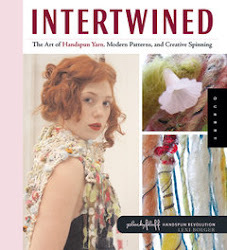 Wooldancer Collier appears in the book Intertwined by Lexi Boeger, published by Quarry Books. All images, designs and text are copyright 2010 Michelle Snowdon. Simple theme. Powered by Blogger.